If you write on the job, then you know that you’re not really done with a project until it makes it through reviews and approvals. A lingering review process can add weeks or months to a project, frustrating everyone involved. 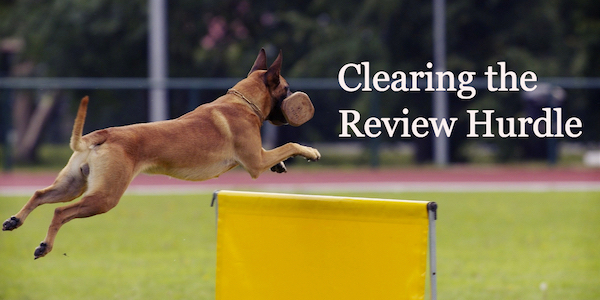 Many writers think of the review/approval process as the last hurdle that their work has to clear. It’s something to get over, get past, or even (sometimes) sneak around. What if you changed your mindset about reviews and planned for them from the start? What would happen if, instead of treating the review process as a hurdle, you saw it as an objective and a goal? This simple shift in mindset can make you more productive and effective while improving your writing. If you’re writing in the workplace, it doesn’t matter how many words you can write in an hour or a day. What matters is how much of your content reaches its target audience. Your writing productivity is measured in finished projects. If you don’t plan in advance for reviews and approvals, your work can linger there for weeks, months, or longer. You might also end up having to revise the content multiple times to please various stakeholders. A little advanced planning can reduce the chance of rework and revision. And by proactively managing reviews and approvals, you can ensure your content reaches is readers quickly. It’s worth spending a little time at the start of your writing project to ensure that the “last mile” will be successful. Even if you don’t need anyone to sign off on your work, it’s still a good idea to run your work past other people for feedback and perspective. The review process is your last chance to check for errors, problems, omissions, and anything else that can get in the way of achieving your objectives. It’s one more opportunity to make sure that the work meets the readers’ needs, not just your own. Reviews, done right, protect the quality of the work. In three quick lessons, I’ll share strategies that you can use for your next project to improve its chances of sailing through reviews and approvals.